Most babies tolerate formula with no problem, but for some babies, feeding with formula can cause a number of issues. If your baby experiences symptoms like hives, eczema, runny nose, vomiting, diarrhea, fussiness, or colic after drinking formula, your baby may have a milk protein sensitivity or even a true milk protein allergy. True milk protein allergies are rare — occurring in less than 3 percent of babies — but milk protein sensitivity is more common. The approach to both is similar: babies with these digestive issues often require hypoallergenic formula. Hypoallergenic formula is very specific. To be called “hypoallergenic” a formula must be tolerated by at least 90 percent of babies allergic to cow’s milk. This means that about 10 percent of babies with confirmed milk protein allergies will still react to many hypoallergenic formulas. This is because even hypoallergenic formulas are still mostly derived from cow’s milk. Soy protein formulas are not hypoallergenic, although they are often prescribed for babies with formula intolerance as a first-line treatment. In fact, about 14 percent of babies with milk protein allergies will also react to soy protein formulas and need to be prescribed a true hypoallergenic formula. There are two kinds of hypoallergenic formula: extensively hydrolyzed formula and free amino acid-based formula. In extensively hydrolyzed formula, the complete, longer milk protein chain is broken into pieces: amino acids and shorter milk protein chains. This makes it easier for babies to digest. Examples are Alimentum, Nutramigen, and Pregestimil. Extensively hydrolyzed formula is not to be confused with partially hydrolyzed formula (pHF), which is not hypoallergenic and contains higher amounts of intact milk protein. Because partially hydrolyzed formula provokes reactions in a high percentage of kids with cow’s milk allergies, pHFs should not be used with allergic babies. However, they may be recommended if your baby has symptoms such as fussiness, gas, colic, or vomiting but your pediatrician thinks that these symptoms are related to milk protein sensitivity instead of a true allergy. Extensively hydrolyzed formulas are more expensive than regular formulas and insurance companies are not required to pay for them. Occasionally a company will pay if you can prove the formula is medically necessary for your child’s condition. Many formula manufacturers even provide form letters to facilitate this process. 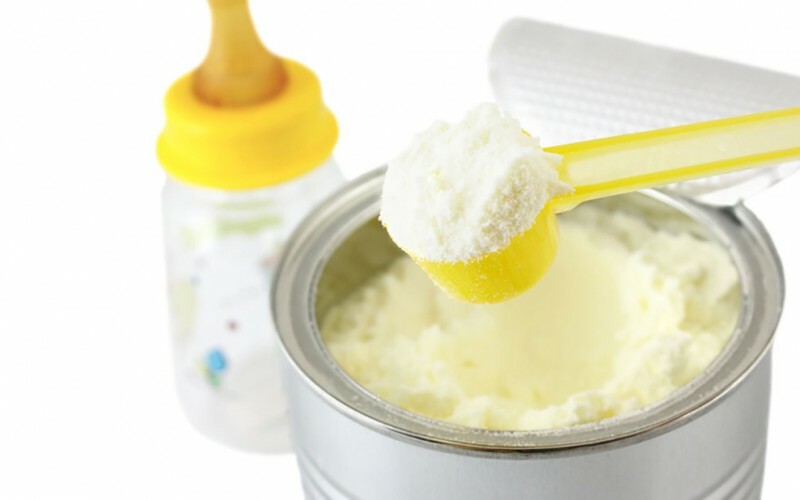 Because extensively hydrolyzed formula still contains some intact milk protein, some babies will have allergic reactions to this kind of formula, too, especially babies with multiple food protein intolerance (MFPI) or other food allergy-associated conditions. For those babies, a free amino acid-based formula may be necessary. In free amino acid-based formulas, or elemental formulas, the milk protein chain is broken all the way down into amino acids, leaving no intact milk protein chains (whey or casein). These are the easiest for babies to digest and the least likely to trigger an allergic reaction. Examples include Neocate, EleCare, and Nutramigen AA. They don’t taste as good as other formula types and some babies reject them. But for babies with severe milk protein allergies, they are literally a life-saver. Three percent of babies have true milk allergies, but milk protein sensitivities are more common among newborns. Two kinds of hypoallergenic formulas exist for babies with sensitivities and allergies to milk. Extensively hydrolyzed formula, while still containing intact milk protein, is easier for babies with milk sensitivities to digest. Free amino acid-based formula has no intact milk protein chains and is not likely to trigger an allergic reaction. Thanks for pointing out that even babies with allergies can find great alternatives to dairy and can lead normal lives!